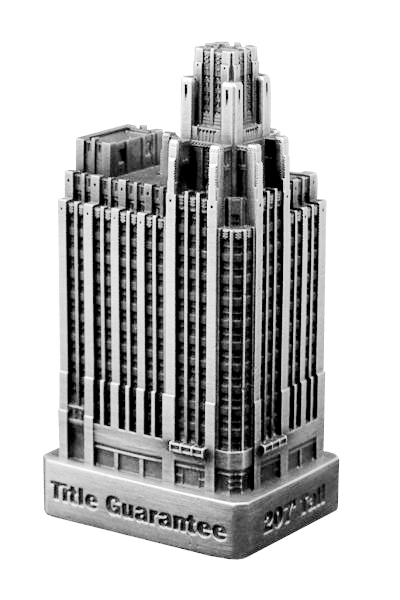 The Title Guarantee Building is located at 401-411 W. 5th Street in Los Angeles, CA and was completed in 1930. This building was designed by John B. and Donald D. Parkinson and Killefer Flammang Architects and stands 207 feet tall with 13 floors. This pewter replica stands 3-1/8 inches tall and is finished in antique pewter. This model's scale is 1 inch = 75 feet. An actual replica of my very own apartment building! By far my favorite miniature building in my collection. Special thanks to Carol for carefully packaging and shipping my purchase to me! !